If you only have a little energy, but could use a whole lot more, the Go Power! 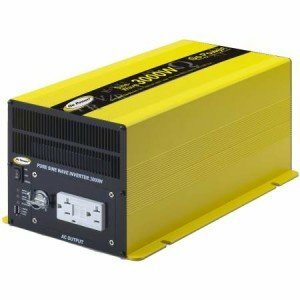 GP-SW3000-12 3000-Watt Pure Sine Wave Inverter is a machine that fits the bill. No matter what you ask of it, we can guarantee that you won’t be disappointed. This beast packs a lot of watts within its frame. You’re looking at 3,000 watts of continuous pure sine electricity. Gems like these don’t come often. Whatever devices you’re powering couldn’t ask for better if they were hooked right up to your power plant or local utility company. It’s good with just a 12 volt input too. You can also rely on a 6,000 watt surge with this bad boy as well. So whatever your needs and resources are, you have an inverter that’s ready to give you power in no time. The Go Power! GP-SW3000 isn’t light on features either. Its manufacturer really did a good job when designing this unit and thinking about what a customer would want from it. First, it has two outlets available, both of which are GFCI protected. There’s also a hardware port right next to them. So, again, whatever devices you need ran, so long as they’re powered within 3,000 watts, this machine not only has the electricity for them, but the resources to keep a number going. Thanks to the GP-DC-KIT5, this unit will also have no issues connecting to your battery source with ease. On the side by the outlets are also a couple readouts to let you know what your machine is up to at all times. It’s nothing too fancy, but it gets the job done. Still, you don’t need to worry because this inverter comes with under voltage, over voltage and overload protection. Power your devices confidently knowing that there are safeguards in place to keep anything from going wrong. The one downside is that this machine definitely won’t get mistaken for being a small device. It’s 17.8 inches by 6.5 inches by 8.2 inches, so you’ll need some space for it. Plus it weighs 21 pounds. It’s quite heavier than other models we tested but with that much power, we can’t complain! However, it’s worth noting that Go Power! spent a lot of these dimensions ensuring this monster unit could handle whatever wear and tear you might want to put it through. And despite its size, you’ll still have an easy time keeping it in your truck or finding a place for it in the garage. In fact, considering all the huge machines this single inverter could easily power—simultaneously, no less-it’s a wonder the thing isn’t twice as big or more. For the pleasure of using this Go Power 3000 Watt wave inverter model, you’ll need to spend quite a bit. It’s no small amount, to be sure, but it’s actually a bargain compared to other units. You may be able to find used models cheaper but the 2 year warranty that comes with it is well worth it. There are all kinds of inverters out there, but when you need one that can handle the full range of products you may need to power, the Go Power! GP-SW3000-12 pure sine wave inverter should probably be at the top of your list. No matter what you need to work, this machine will make it happen. Im one of your follower, i want to buy Go Power 3000 watts, how can i send my payment if ever? Im from philippines…. i need it badly… hope i recieve a message to you guys…. thank you! What is the good to to use for input voltage of inverter if i have 600 watts solar panel which is connected in parallel it must be connected in 12 or 24 volts from solar?as well as 24 volt input inverter ?to drive my 3/4 horsepower airconditioning in my home.how many watts do i need to use the inverter. I am looking for a 5000 watt pure sine wave inverter. Looking for your recommendations.